North Hampton, New Hampshire Based Runnymede Investments announces plans for growth and promises to a bright future for Smuttynose Brewing Company, NH’s bestselling craft brewer. Egelston and Lindsay will be working closely to ensure a smooth transition and to shape the next generation of sales and marketing for the brewery. Founded in 1994, Smuttynose Brewing Company, employs 66 people and generates more than 10 million dollars in annual revenue. It is the Granite State's leading craft brewery and produces some of New England’s most popular craft beers. 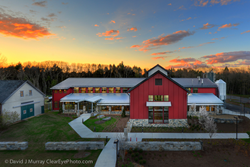 The sale includes the Smuttynose brand, its state-of-the-art, LEED - Gold certified facility on the historic Towle Farm in Hampton, and Hayseed Restaurant located next to the brewery on the picturesque 13-acre campus. The brewery is among the largest in New England, capable of producing 75,000 barrels a year. Runnymede Investments is a family owned and operated investment firm headquartered five miles from the Smuttynose Brewery in North Hampton. Runnymede specializes in real estate, private equity, and venture capital.